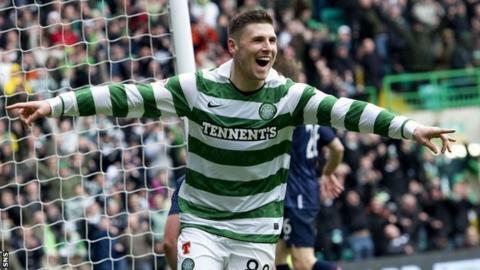 Celtic have opened talks over an improved contract for Gary Hooper, the striker who ended their title-winning season with five goals against Hearts. Southampton failed with a bid to sign the 24-year-old in January and could make a fresh bid now that they have won promotion to England's Premier League. Celtic boss Neil Lennon said: "We had a preliminary meeting with his agent last week and it was very cordial. "It went very well and we made it clear that we want Gary to stay." Englishman Hooper, who scored 29 goals last season, joined Celtic in a £2.4m move from Scunthorpe United, then managed by Southampton manager Nigel Adkins, in 2010 and remains under contract. "Gary likes it here and he's happy here," added Lennon. "He's had such a good season and he's such a good player that no doubt there'll be clubs in for him. "But we'll try and resist all offers that come our way." Lennon was talking ahead of a 2-0 defeat by Norwich City at Carrow Road in a testimonial match for Canaries full-back Adam Drury. Hooper, fellow striker Anthony Stokes, defender Kelvin Wilson, winger Kris Commons and goalkeeper Fraser Forster were the first-team regulars to face former Celtic midfielder Paul Lambert's side. Cheered on by 2,500 travelling fans in an 18,500 crowd, the Celtic side containing several promising youth players went down to goals from James Vaughan and Arsenal's Henri Lansbury, who was previously on loan at Norwich and appeared as a guest.